If you like looking at dragonflies and damselfies but aren’t quite sure where to go I can take you to the best places to see all the Highlands specialities and the common species. I have an unrivalled knowledge of the Highlands’ Dragonflies and 15 years experince of studying them. 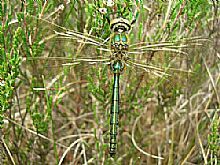 In season, June to July, White-faced Darter, Northern Emerald, Brilliant Emerald, Downy Emerald and Northern Damselfly can all be seen less than one hours drive from Inverness. When exploring these habitats we will see all sorts of other wildlife. When out and about we will be looking for larvae as well as the adult insects so there will be the added fun of pond dipping during your day out. 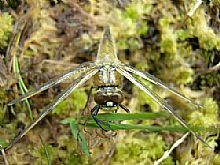 Just about every watery habitat in Highland has some dragonflies and damselflies in it. You just need the correct tools to search for them; in this case a colander. If you want to find out just why this and a plastic spoon are essential kit for pond dipping you will have to come along on one of the tours to find out why. If you wish we can try and net some of the species for a closer look, but more rewarding is patiently, creeping up on perched insects; you will be amazed at how close you can get. Let me know what you want to see and I will make up an itinerary especially for you.